I made this for parents’ snack which apparently was a welcome treat to the all-too-common crackers and carrot sticks. Makes roughly 10 to 12 servings. Optional: If you prefer, the sliced bread can be toasted first before spreading the mustard butter. In a bowl, beat the butter with the Dijon and whole grain mustard, lemon zest and 1 tablespoon dill and season with salt and pepper to taste. Spread the mustard butter onto the sliced bread. 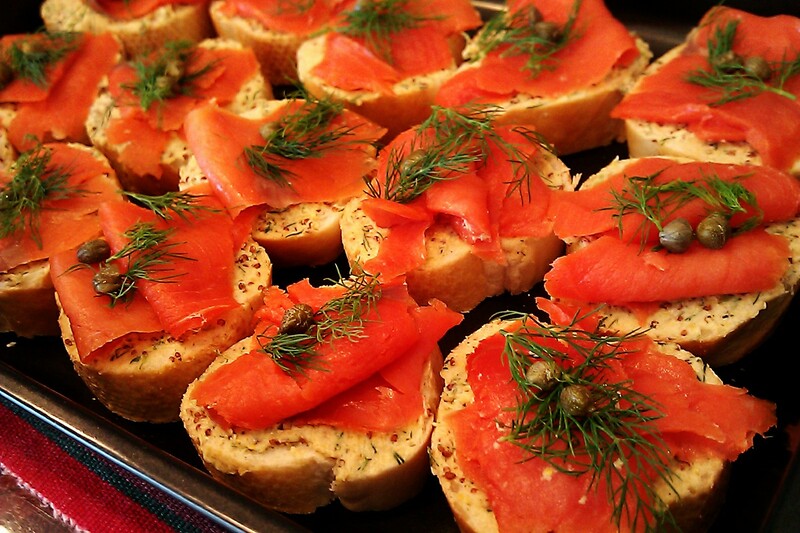 Top with smoked salmon, a couple of fresh dill sprigs, a couple capers and arrange on a platter to serve. I adore smoked salmon. These look delish! Now this is my kind of snack – love smoked salmon! I never thought to use the Dijon mustard which I definitely will next time. you made them look so pretty. Thank you Diane. Next time I’ll try toasting the bread see how that changes the texture. But they worked just fine on fresh French bread. That really looks tasty! Such a great idea to shake up the appetizer plate! LOL! But now they can’t wait to see what I make next. No pressure. Thx! Makes a great appetizer too. thanks! the teacher and the parents enjoyed having something “gourmet” at school. lol.